One of the best things about being in the PC community is sharing awesome experiences, be that uploading a video of the coolest thing you’ve done today, or creating a brand new level using a game’s tool set. This video that our Nick found is a combination of both those things: a video of a community made track in TrackMania 2. It’s absolutely insane. Created by vossi84, the track [PF] Extra Large is one impressive piece of work. 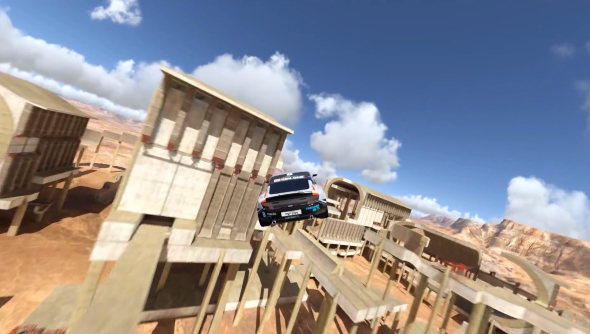 It’s full of massive jumps, loop-the-loop track design and impressive speed sections. The video is captured by driver AccelTM, and from the footage you’d think he’s a pro racer; not once does he skid out or crash head-first into a concrete bollard. Perhaps he is that good a driver, but for this map he certainly doesn’t need those skills. To complete this circuit, all you need to is press and hold the forward key. The track is so meticulously designed that it knows exactly where your car will land and skid, and adjusts the position and camber of the road to ensure you keep going at maximum speed. This is track design at its most mind-bogglingly scientific best. It may not take much effort on behalf of the driver, but this must have been one frustratingly technical track to design and build. If you’re a TrackMania 2 player, you can grab [PF] Extra Large from the ManiaPlanet Track Exchange.